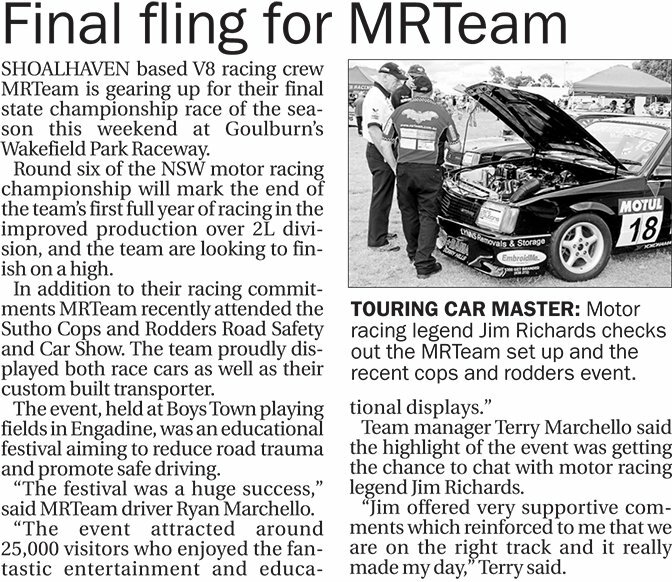 SHOALHAVEN based V8 racing crew MRTeam is gearing up for their final state championship race of the season this weekend at Goulburn’s Wakefield Park Raceway. Round six of the NSW motor racing championship will mark the end of the team’s first full year of racing in the improved production over 2L division, and the team are looking to finish on a high. In addition to their racing commitments MRTeam recently attended the Sutho Cops and Rodders Road Safety and Car Show. The team proudly displayed both race cars as well as their custom built transporter. The event, held at Boys Town playing fields in Engadine, was an educational festival aiming to reduce road trauma and promote safe driving. “The festival was a huge success,” said MRTeam driver Ryan Marchello. Team manager Terry Marchello said the highlight of the event was getting the chance to chat with motor racing legend Jim Richards. “Jim offered very supportive comments which reinforced to me that we are on the right track and it really made my day,” Terry said.